Every 50 years or so, a massive star in our Galaxy explodes in what is called a supernova. In the explosion, the star's outer shells of gas are blown into space. This hot gas gives off X-ray radiation, which astronomers can photograph using special telescopes in space. What remains of the star is squashed into a tiny ball, which is then called a neutron star. A neutron star has a mass about twice that of our Sun, but packed into a ball that is only 24 kilometers wide - that's about 60,000 times narrower than our Sun! 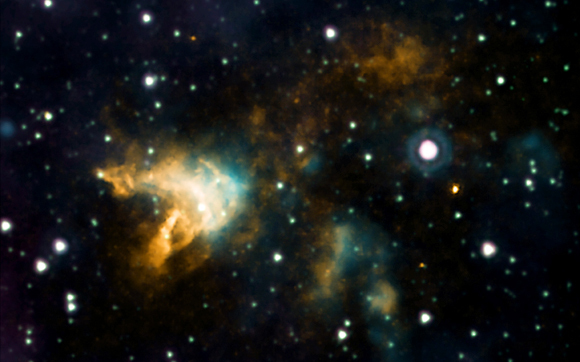 The new space photo shown above captures the gassy remains of one such supernova explosion. Curiously, the position of the neutron star (move the cursor over the image to see its location) is far away from where astronomers think the explosion took place. If the estimated location of the explosion is correct, then astronomers say that this is an extra piece of evidence that neutron stars can be given powerful "kicks" during a supernova explosion. Cool fact: According to astronomers' calculations, this neutron star has been moving at a speed of at least 4.8 million kilometres per hour since the explosion!